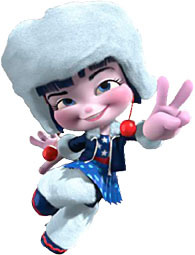 Adorabeezle Winterpop is the prettiest, happiest, most amiable ice champion of all time. She’s a racing and skiing fanatic who loves exploring new tracks hidden on the sugar-covered slopes of Sugar Rush. This racer lives up to the "winter" part of her name - she wears a furry hat and leggings, and her skin has the bright pink shade of someone who's been outside in the cold. Actually, come to think of it, she looks a lot like Icelandic pop sensation Babba Bjork. It's the pitch black hair and the narrow eyes that do it. If you look at the actual renders of the character, the "fur" trim on her outfit is actually foam of some sort - meringue? Latte? Cotton candy? Don't know. The drawstrings on her hat are cherries. She does seem to be missing some paint apps, though: her blue skirt should have white stars on it, and though it can only be seen from certain angles, her hat needs red and blue panels, not solid black. They painted two red stripes on her shirt (to suggest the American flag that's under that coat), but not the stripes on her sleeves. 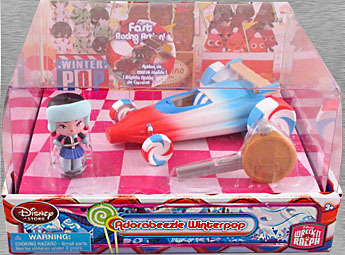 Adorabeezle's ride is a Rocket Pop: you know, the classic red, white and blue popsicle, which converts to a race car very easily; it's already got the right shape - narrow at one end, wide at the other - and the ridged/stairstep shape carries over nicely, as well. 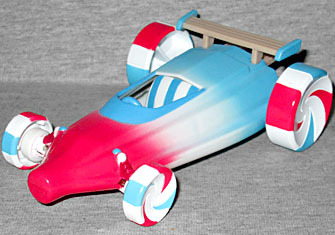 The wheels are the same colors as the body of the car, just done as swirls rather than stripes. The coolest feature, though, is that the spoiler on the back of the car looks like wood. That may seem out of place in a world where even the trees are made of candy, but remember: popsicle. You've gotta have a stick for a popsicle. A popsicle without a stick is... well, it's an Otter Pop, but you know what we mean. There are two more sticks coming out the back - a nice little touch. The racer sets are sold in nice boxes that display the toys well. The entire top is clear, allowing full views of the car and the figure (as well as the golden coin key). The bottom of the display is pink and white checkerboard, showing the start/finish line, while the back shows some of the grandstands - Adorabeezle's own peppermints, the teddy grahams that pull for Crumbelina Di Carmello, and the candy corn that roots for Gloyd Orangeboar. This is a really lovely display, perfect for MOC collectors. 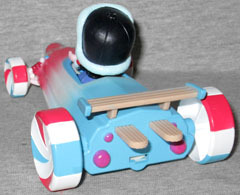 The gimmick of Sugar Rush was that the game featured different racers every day: part of that was that there were nine playable characters at any one time, while the game had at least 12 potential models. But the game also upped that number through the time-honored tradition of palette swaps. In a blink-and-you'll-miss-it scene, there's a pink version of Adorabeezle, which drives a similarly pink-ified version of the Ice Rocket. According to the scoreboard, her name is "Nougetsia Brumblestain," so if you really want to be a completist, you'll want to buy a second to repaint. maybe the "fur" is shaved ice? like a sno-cone?